The charming Italian specialty restaurant Spuntino (which means in Italian snacks!) is known for 25 years of top quality. 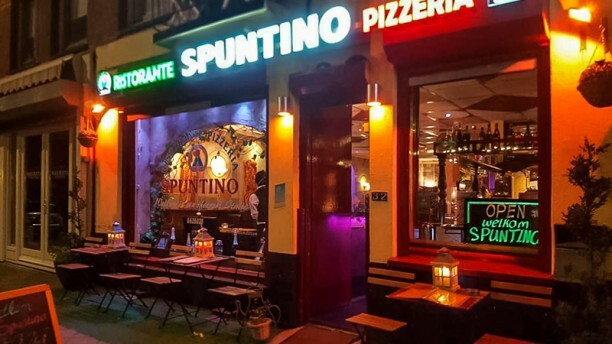 In the 80’s Spuntino was the first Italian restaurant in Amsterdam that delivered pizza, meat and fish dishes at home. Spuntino has been for more than a quarter century in the heart of many an Amsterdam. Owner Ramon learned as a little boy from his mother, which is reflected in the purity of the dishes. A special blend of spices used for Spuntino pizza sauce is their best kept secret. A delight for the real Italy lover! The lady running the front of house however quickly setup a table for us to be seated at....albeit somewhat cramped and blocking another table of dinners in their seats unless we got up to let them leave. There seemed to be an issue with staff and perhaps they were short handed as the one lady was run off her feet doing everything. We ordered drinks and received them about 30 mins later. Strangely there was no wine list just house white or red by the glass or 1/2ltr or 1ltr. Not a problem tho as both were reasonable. When the food arrived it was great, the kitchen certainly was in order. Lovely starters and mains followed quickly with freshly made pizza’s and pasta dishes all tasty and straight from the pan. Couldn’t fault the food, sadly the front of house let it down but I’m sure this was due to a staff shortage.